This game truck was specifically designed for older kids this game truck has just what they are looking for. 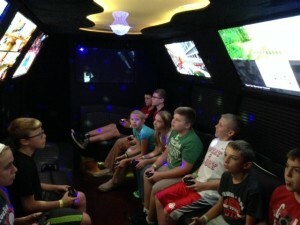 Up to 14 kids can play on one of 5 game stations. Big screen tv’s with a dedicated Xbox or PlayStation. Plus satellite TV or top 40 music videos pay on another big screen TV, music thumps and laser lights flash. There’s even a touch screen photo booth with a prop box and photo realistic printer. For guests 14 and older. 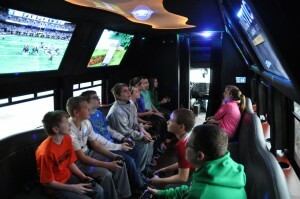 Click here for the Game Craze video game truck for kids ages 7-15. How it works: We come to you, load up your favorite games and music and up to 14 guests can play, dance and take photos for 2 hrs. Additional time can be added. 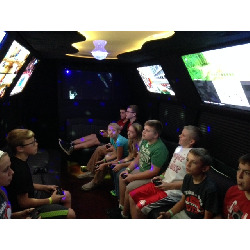 Everything you need in a video game party bus, Xbox, PS3, PS4, satellite TV, Photo Booth, DJ sound and Lights. Rene was very easy to work with. I appreciate the constant emails that gave me details on what we needed or expected. Greg was AWESOME to work with. With 120 people in attendance to our block party, he entertained the kids and WORKED! He never sat. He interacted the entire time and did an awesome job entertaining the kids. Some did not know about the Photo Booth, and he did a great job showing it to the kids and getting them in there. Greg did an excellent job representing your company. The bounce house was a hit. Greg set up on time. He was wonderful to work with and we appreciate his efforts! Thanks again!